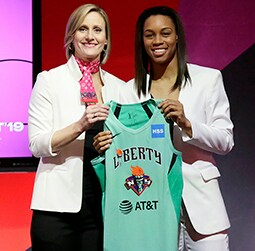 NEW YORK, NY – January 22, 2019 – In her fifth go around with the New York Liberty, Sugar Rodgers showed spurts as to why she was named the Sixth Woman of the Year just a season ago. The Virginia native reached a season-high 16 points in three contests this season-first, in a matchup against the Indiana Fever (6/10). While shooting 50-percent from the field, she showed off her range by draining a season-high five-three pointers. 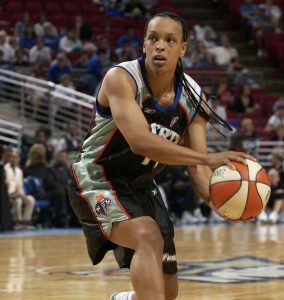 Again, when the Liberty faced off against the Washington Mystics (7/21), Rodgers netted four threes and went 4-of-4 from the free-throw line. 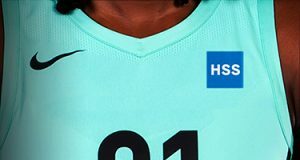 Her other 16-point stint occurred against the Connecticut Sun (8/1), where she also took on a role in assisting others by dishing out six assists, one shy of her career-high. On July 15, 2018 the three-point assassin moved into fifth in three-pointers made in franchise history. She added 14-points on 2-of-4 shooting from deep to her monumental day. 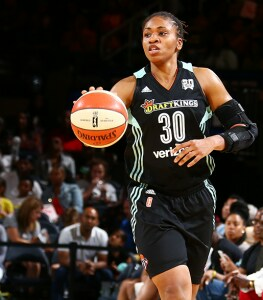 The 5’9 guard registered her lone double-double of the season on the road against the Las Vegas Aces (8/15). In 32 minutes of play, she tallied 11-points, pulled down a career-high 10 boards, and went a perfect 2-for-2 from the charity stripe. Rodgers made improvements from a season ago in her free-throw shooting percentage and field goal percentage. Accounting for eight performances where she did not miss from the free-throw line, Rodgers increased her free throw percentage from 81.5 percent to 82.6 percent. She also upped her field goal percentage from 33.9 percent to 36.2 percent, the second highest field goal percentage in her career.